Review: "Sysomos MAP - Easy to Use Social Listening Tool"
Sysomos MAP is typically used by the social team to provide initial listening into volume, trends, sentiment and authority around a conversation among social audiences. This includes research for new business efforts, competitive auditing, always-on social channel maintenance and internal comms. Different users access different functions within MAP and collectively, our team takes full advantage of the software's offerings. Sysomos Map is well suited for higher level social listening and gaining a sense of a competitive landscape, opportunities for brands to optimize their social messaging and identifying influencers discussing a particular product or trend. Sysomos Map does not provide much value when looking into paid media activity, user emotion or channel activity beyond Twitter and Facebook. User Review: "Sysomos Map Reivew"
[It's] Used to track trends inside and outside the industry. Also used to track campaign performance for hashtag usage, community growth etc. Perfect for researching social trends and conversations. Not suited for campaign tracking or set community management. Review: "3 years with Sysomos MAP - what I've learned"
We enable distributed use by users around our global business, though primary use is centered on key brand and PR users. Our priority is monitoring the impact of our brand in the marketplace, including through share of voice on strategic area of focus. Ad-hoc research. During planning phase of a campaign it is a helpful tool to understand the marketplace, key influencers and topics that engage a target demographic. Post-event hashtag analysis. Rapid generation of reporting on efficacy of a campaign, key voices, topics that resonated, viral reach and more. User interface. Friendly and accessible enough to minimize training needs and enable decentralized access, though we have found some hand-holding is still required to get the most out of the platform. Limited API access to some networks. Though this is hardly unique to Sysomos, the limited APIs provided by closed-networks like LinkedIn and Facebook, and others like Instagram, often disappoint our users, who may have unrealistic expectations as to what we can report on. In reality, Sysomos MAP is highly focused on Twitter, which is often not our core channel. Though Sysomos is bound by the limitations of the APIs provided, perhaps some creative innovation would enable limited but interesting observations. Identifying LinkedIn statuses that were simultaneously pushed to Twitter, for example, gives a window into that otherwise private world. Scraping of LinkedIn's trending topics might be revealing. Sentiment analysis is automated and therefore only moderately accurate. Some advanced customization might enable us to get better results, perhaps by uploading custom dictionaries of positive, negative or neutral terms. For example to a loss-adjuster or insurer, many terms like flood, bankruptcy, damage, fraud risk etc may in fact be used positively as part of a marketing proposition or work undertaken ("X company insurance saved us from awful disaster"). Automated systems will always struggle with these. I wish I could make mass-edits to such inbound comments that would learn and persist. Highly effective to measure a Twitter campaign post-event or campaign, where there is a defined period of time and a pre-defined hashtag (or hashtags) to be measured. Limited at measuring closed networks such as Facebook and LinkedIn. User Review: "Sysomos MAPs your way to quick insight"
We use Sysomos MAP as a way to get quick insights and numbers for a broad overview of a topic or issue. It can give ideas for volume and what potential irrelevancies may come in without going through a full set up of a monitoring project. It can also provide really good insights on influencer and interrelated communities identification, if that is something that is of use to the client. The tool is used primarily for desk research. 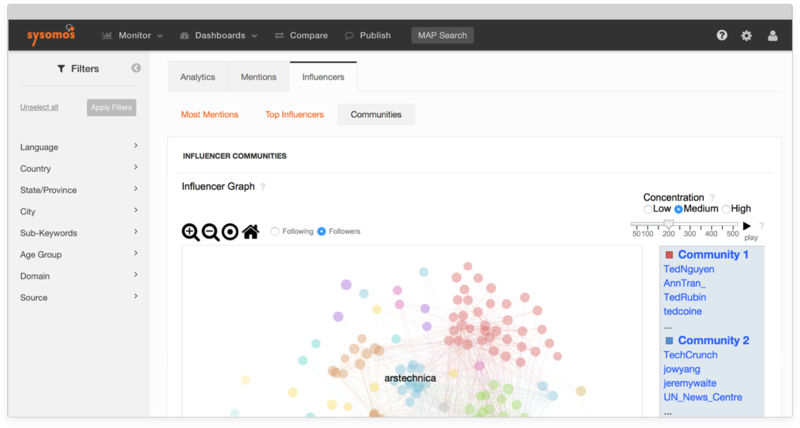 Influencer and communities identification is definitely a strong suit for the tool. Historical data back a year. It does not provide a visual for volume over time. The visuals aren't excellent, and would require an export to create better looking graphics. The interface isn't intuitive and sometimes requires clicking around to find things that seem like they should be under a different title. It is well suited to quick turn projects that require very little as far as specific data is concerned. If you're trying to dig into the mentions to garner insights, it can be difficult to view things and find the most relevant content. But if you're looking for broad overviews leveraging big data insights, it is excellent. User Review: "Thumbs Up for Sysomos MAP"
Sysomos MAP is used across the whole organization to measure impact of social media campaigns on Twitter. It is also used to find social influencers. It is very well suited for Twitter campaigns. For Facebook and Instagram, you will have to measure manually. User Review: "Sysomos Map Rules!" I was consulting with a company that was involved in political polling and social media for political candidates and campaigns. I used Sysomos Map to query conversations regarding candidates, their campaigns and other wide varying subjects regarding climate change, alternative energy and traditional energy economic impacts. Sysomos Map gathers conversational data across the internet in detail from websites, forums, blogs and all major social media outlets. Sysomos Map is very effective at being able to reach backwards in time; which was very important and enlightening for my work. It is particularly good at being able to look backwards in time at conversations. The information generated from queries is rich, and comes off in real time. The graphs generated along with data as spreadsheets is intensely rich with useful information. Sysomos MAP does take some significant ramp up time to get a comfortable level of usability due its richness and sheer power of scraping from billions of conversations and web data. Sysomos MAP needs better tutorials and tools to help users quickly become adept at using. Sysomos should offer longer trial periods. The entry price is quite [high] compared to other tools that are now offered. The pricing structure is makes entry tough for many businesses and Sysomos could do better by offering alternative pricing and use possibilities. I think purchasing or leasing Sysomos MAP is well suited for large media and advertising organizations. Sysomos MAP Review: "Map is a great listening tool with a few expected caveats"
It is primarily used by the firm marketing team for brand research. We also use it on a limited basis for client research. On the client side, we use it most frequently for share of voice research. That means when we are doing a RFP or something, we'll show a client how they stand in their competitive environment. Most clients at this phase aren't doing any social efforts (or poor ones), so the results can be quite startling. It's good for identifying trends over time - focusing in on what caused conversations spikes. Their influencer/klout score algorithm is worthless - it caps out at 10 so the New York Times and Jo Schmo gamer dude and Justin Bieber all have the same score. The Boolean builder can be frustrating, it will tell you there is an error, but gives you no indication of where. In a complex string it can take forever to figure out what you messed up. Twitter listening only goes back one year. If you ever need to compare something year over year, without anticipating the need in advance and downloading reports, you're screwed. Sysomos is not very helpful for brands that don't have a high number of mentions and aren't consumer facing. We're a B2B firm, so our traction on social is pretty minor. If you are in a bigger arena with a lot of major mentions and campaigns to analyze, this tool would be a lot more useful. Sysomos MAP Review: "Sysomos: track your marketing footprint on real-time"
At my company, the Insights team uses Sysomos MAP on a daily basis for many different clients; from CPG to financial brands and many more. The tool is reliable and we mostly use it for real-time monitoring, tracking what people are saying on different digital channels (social media, forums and blogs) about a specific brand or campaign. Identify most retweeted and most authoritative tweets. This helps us understand why and how conversations go viral and who is influencing the overall sentiment. Show volume trend and popularity. A snapshot overview on how conversations are evolving throughout a specific date range. This helps us analyze relevant spikes and predict future analysis. Build queries and analyze everything and anything. Within Sysomos, we can build infinite queries and also analyze competitive share of voice. Sentiment. The sentiment analysis in Sysomos is not as accurate as it is in other third party tools where you can apply/modify sentiment manually. Any link of content analyzed within Sysomos should open on a different tab. Sysomos is well suited for real-time monitoring, social campaign awareness tracking (especially the ones using hashtags), media news influence, competitive analysis and corporate communications narratives. If you are looking for a monthly reporting tool, you don't need Sysomos. This is a tool you want to use everyday to understand what people online are saying on a daily basis. Sysomos MAP: "I miss you, MAP. Review from a former user." In both occasions, I found Sysomos MAP to be incredibly helpful. Being able to save searches and return to them over time was great, though I did wish for the ability to get a regular update mailed to me with new hits/data. The interface isn't the most user-friendly/visual in this space, but the quality of the data and speed of the product made that worthwhile for me. Their customer service is also top-notch: very helpful, friendly and quick to respond. 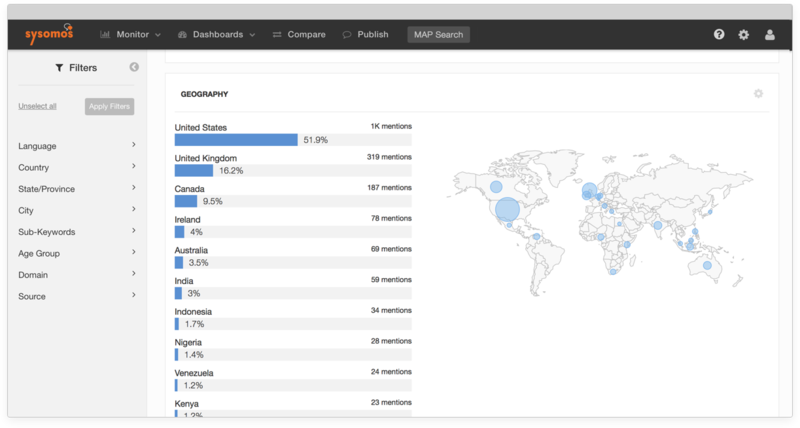 If you are an agency that is interested in gathering social media data about your clients then Sysomos MAP is a great product. If you're looking for more of a social management tool then this isn't for you, though Sysomos does offer a different product for that. Review: "Sysomos Map for Social Planning and Insights"
We use it for 3 functions. Monitoring, measurement, and insight development. Quickly allows us to pull basic data. Very easy to use if you know how to construct Boolean queries. Flexibility to quickly update keywords / queries. Needs more and faster growth for shared / owned channel analysis. It is twitter heavy. Pulling from more social sources would be ideal. Overall the ease of use, flexibility, and speed of the product makes it VERY useful for us. 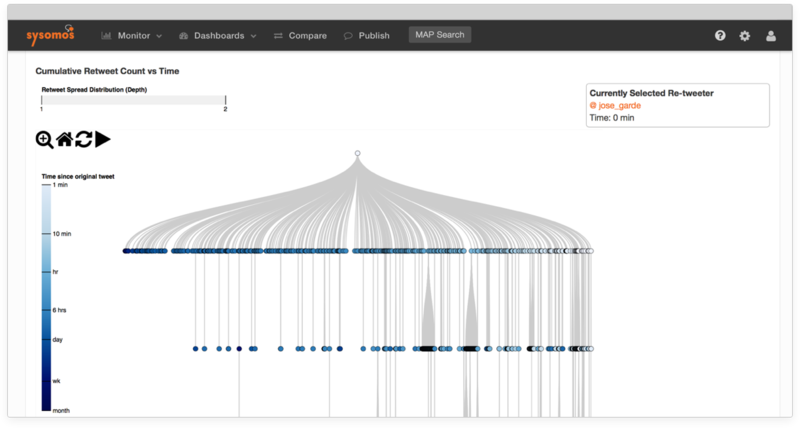 Sysomos MAP Review: "Best listening tool for quick results and flexible Boolean queries"
Utilizes Boolean queries which enables user to build very specific, complex searches. Returns search results in near real-time (vs. several hours or days like competitor products). Easy-to-understand, intuitive platform. Easy to navigate through listening results. Customer service response time can be inconsistent. For those new to listening products and/or Boolean queries, it would be smart to ask what kind of service level they could expect. And also to get a certain number of hours or predetermined number of training sessions in writing as part of the contract. With all listening tools, there is a learning curve. If your business or agency doesn't have knowledgeable people in house, you'll want some training beyond what's available in the FAQs section. Review: "Sysomos MAP: So easy to use, even an intern can't mess this up"
This platform was particularly useful in organizing Twitter data. It accurately pinpointed the tweets' impressions (positive, neutral, negative), saving me time I would have spent sorting. 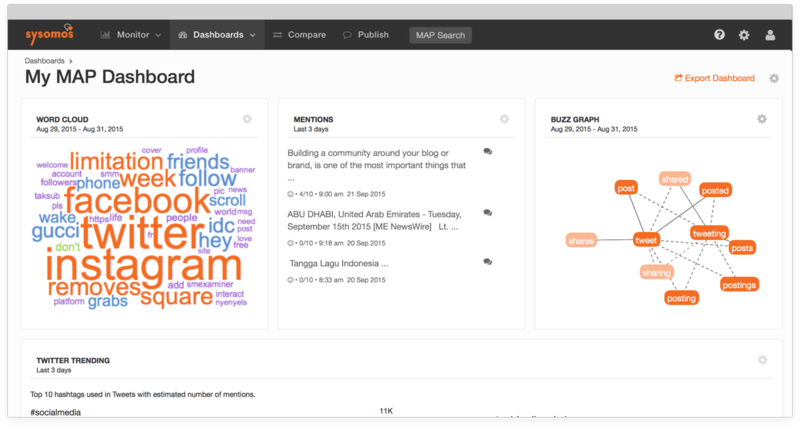 The buzzgraph feature has a lot of potential in providing insight leads. I found that the 2nd, 3rd, etc. searches using combinations of buzzgraph words often led to the heart of a question or conflict I was researching. The sentiment graphs were very useful as timelines of when an issue was hot. More importantly, it allowed the user to tell how long that issue remained popular as measured by the # of social media posts and news reports. Searching through forum posts was a painful experience because the platform had trouble sorting through spam. I would find myself reading through duplicate spam posts rather than original content/posts. I wish there had been an option to search through Instagram. I wish there had been auto-detection when it came to boolean logic errors. It was frustrating locating where I had missed quotations or a parentheses when I made very specific searches. Sysomos MAP is easy to use, but the depth of what it has to offer is not immediately apparent. I would avoid jumping right in and instead shadow a more experienced user as he or she goes through the process of completing a search. You will likely find quite a few tricks to use in sorting through irrelevant data. Plus, certain features lend themselves better to specific social media platforms. Review: "Sysomos MAP is a staple in my analysis methodology"
The tool provides quality information on demographic and geographic breakdowns. The tool's capabilities of quickly altering boolean queries and the versatility in search and filtration is especially nice to have. For whatever reason, conversation numbers do not match similar tools using the same search queries. Exported data could be organized in a fashion that would make information easier to analyze. Sysomos MAP Review: "Faster than Radian6 and better-looking reports." Sysomos MAP Review: "Sysomos is great, but it isn't the best thing out there"
Twitter aggregation into one place. Comparison analysis of Twitter handles. Multi-word assessment. Understanding two word phrasing rather than only keywords. Sorting keywords by positive and negative connotations. I would recommend the product, but I don't think it is the best product out there if you are managing brands. I would review multiple products and see which one is the best for the specific tasks at hand. Sysomos is great for some things, but not for others. On our team, we have people who use it for finding blogger influencers, people who help guide social strategy, and people who post and community manage. What is right for one person might not be right for another. Review: "Sysomos MAP used for advertising agency"
Sysomos MAP Review: "Boolean logic powerful but tricky to learn." Using Boolean syntax, we are able to tap into what conversations are happening around the search set. Searches are keywords-based, but the Boolean capabilities allow us to filter the data set to drill down to precisely what we want. Although Boolean logic is a powerful way to filter large data sets, the syntax can be tricky to learn. For full-on sentiment analysis capability, Sysomos Heartbeat might be a better choice. In Hearbeat you can see what people are saying specifically. You can also alter sentiment (e.g. from negative to neutral). In MAP you cannot manipulate the data in this way. Sysomos MAP Review: "Very comprehensive data, but influencer ID weak." The user interface was very intuitive. This was important for us as we let others use the product without much training. Comprehensiveness of data was also excellent. The system caught a large number of blog posts, etc. This was augmented by the full Twitter fire hose. Sysomos also generated decent visuals. We did not have to export the data to Excel to get acceptable looking charts and graphs. The system generated graphs that we could re-use.directly with clients. Influencer identification. Influencer functionality is designed to tell us ho are the most influential people on a given topic. Sysomos was not great at this. It looked at someone's social graph and could tell us who a specific Twitter user is connected with, and how often they interact with these people. But it was not stellar it identifying who were the true influencers rather than those, for example, who just re-tweeted content from someone influential. This is an immature area. These tools are typically good at counting re-tweets, but not at identifying who the re-tweeters are. Influencer ID was a nice to have for us, rather than a strong requirement so we could live with this weakness. Sysomos MAP is a social research engine that is designed to deliver deep, actionable insights into the people and conversations that matter most to an organization’s brand. The vendor says MAP is key to making sense of social media data and using it to design the most effective social listening, content and engagement programs. This solution is focused on helping organizations identify key influencers, understand customer sentiment and track their social strategies over time.